The payments are worth up to a combined $12,000 for each eligible household. Claims lodged after 2 December may only qualify a farmer to receive the second supplement payment. 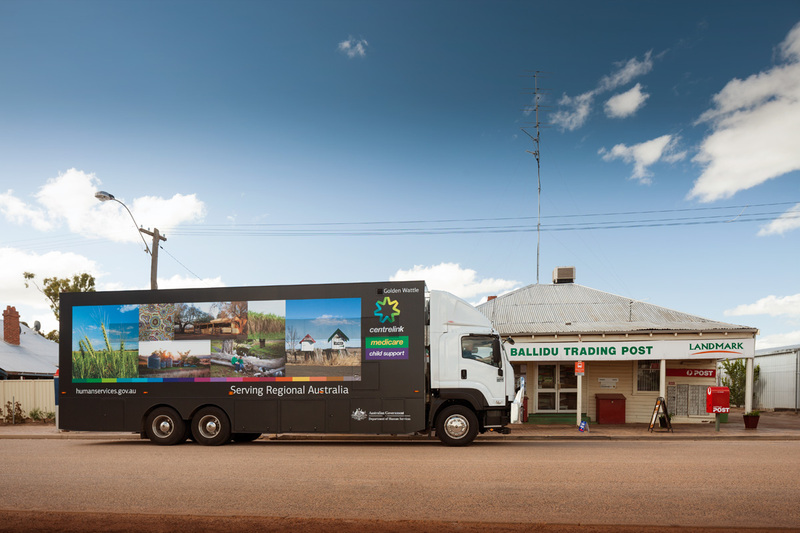 The department’s Mobile Service Centres have toured drought affected rural communities this year, raising awareness of the Farm Household Allowance. Staff at selected Service Centres around the country have opened on Saturday mornings to help farmers apply for the payment. More than 180 farmers from around the country attended the weekend sessions. 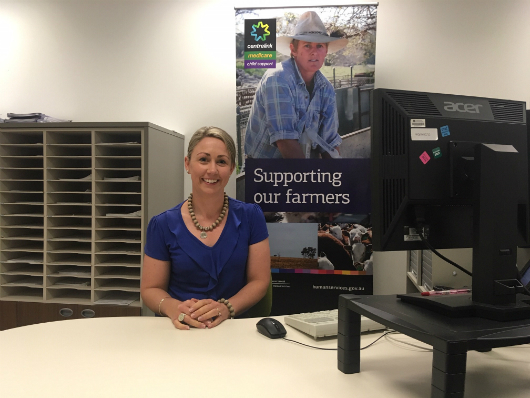 Kingaroy Customer Service Adviser, Tamara, helped customers lodge claim forms for the Farm Household Allowance at one of the special weekend openings. “My colleagues and I wanted to reach out to farmers in our community to show we care,’’ Tamara said. “They are going through a hard time and we want to make sure they know about the payments and services available to help. Tamara said farmers received help with their claims and other payment inquiries. “The claim form has been simplified and the easiest way to apply is online,” Tamara explained. 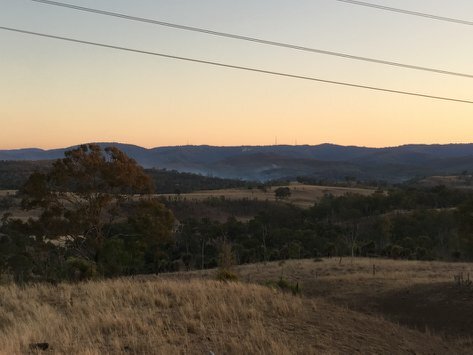 “But farmers can have quite complex financial circumstances so it was a good opportunity to spend the time explaining claim processes and the information we need to assess their eligibility. “It was rewarding to get positive feedback from farmers on the day who said they appreciated the office being open just for them. “Once word gets around I think we might see more farmers coming into the office in the future. 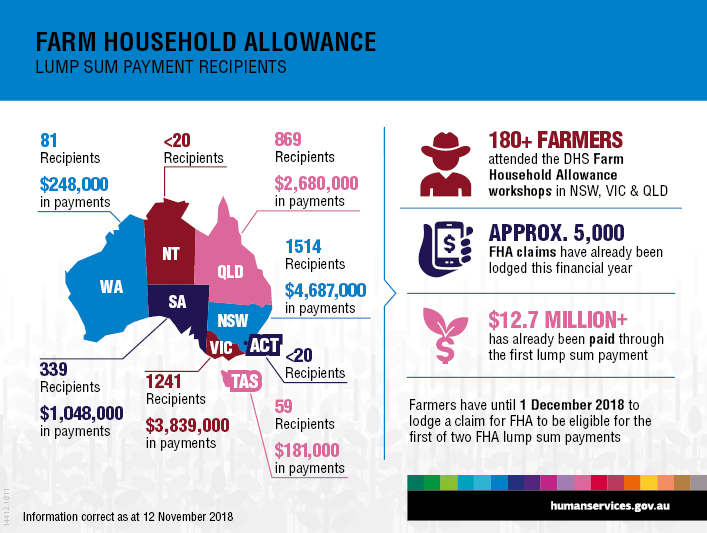 More than $12.7 million dollars has been distributed to more than 4,100 farmers through the first supplement lump sum payments (as of 12 November 2018). Payment of the first lump sum started during September 2018 and the second payment is scheduled for 1 March 2019. 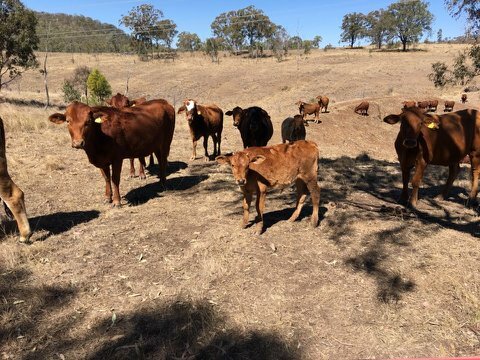 For more information on applying for the Farm Household Allowance visit humanservices.gov.au/farmhouseholdallowance or call 132 316.